Our D1000 Series is a sensitive, low force switch that senses as little as 0.25 inches of water. These sensitive single pole switches can be used as pressure or vacuum switches and differential pressure switches. The switch can respond to rapid pulsing and the gold plate contacts can handle low level switching currents. Connect the pressure source to Inlet Port B and set the adjusting screw to the desired set point of pressure. Turning the screw clockwise narrows the gap between contacts and decreases the pressure set point. Turn the pressure adjusting screw counterclockwise has the opposite effect. 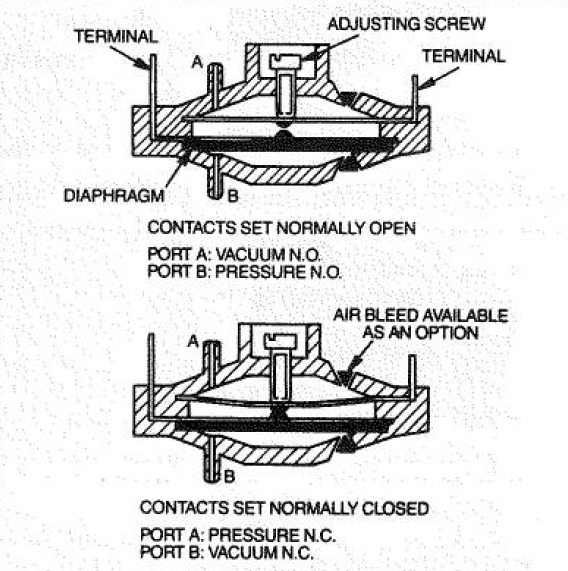 Note that the media entering through Port B is separated from the electrical contacts by the diaphragm. Connect the pressure source to Port A and monitor continuity across the terminals. Slowly turn the adjustable screw clockwise, narrowing the gap between contacts until the contacts are closed. Apply the set point pressure which will open the contacts. Continue to turn the adjusting screw clockwise until the contacts make and break at the desired point. 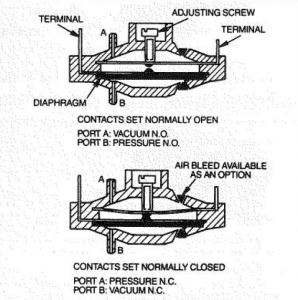 For vacuum switching, repeat the above procedure using Port A for Normally Open contacts and Port B for Normally Closed contacts. For more information about our D1000 Series, visit the product page or contact our direct technical support.